The Nation is continually developing new access options for our readers. Check this page for all the latest ways to read The Nation. Click one of the following links to learn more about our online, digital, mobile and e-Reader options. The Nation‘s own iPad and iPhone app is now FREE TO PRINT AND ONLINE SUBSCRIBERS. Current subscribers can visit the iTunes Store and download the Nation app for FREE. Then just enter your subscriber info and you’ll be able to access every issue of The Nation on your iPad or iPhone. You can also purchase a subscription directly through iTunes, but if you purchase directly through iTunes, you will not be able to access our online content, nor will you have access to our digital archive dating back to 1865. The interactive iPad and iPhone subscriptions include all of the content from each weekly issue of The Nation, PLUS multimedia features including infographics, videos, podcasts and live blogs updated in real time. Would you like to get full access to all Nation content (including our historic archive) through your web browser? Readers may purchase our Online Edition, directly from The Nation, by visiting this page and choosing the "Online Edition" option (you can also order it over the phone by calling 1-800-333-8536). This edition is viewable on your PC, MAC, or via any web browser, and includes access to our full archive spanning 1865-present. New issues are available every Thursday afternoon, immediately after we go to press with the print edition. Online Edition subscribers will also receive a weekly email alert announcing the issue's availability, as well as the option to view it in a format that reads exactly like the print magazine (PDF viewing option). To download a sample PDF issue of The Nation, click here. Please note that your Nation print or Online Edition subscription does not include e-reader access. NOTE TO PRINT SUBSCRIBERS: The Online Edition is available FREE to print subscribers. Register for free online access HERE if you are a print subscriber. You can read the issue online BEFORE it's mailed to your home! Would you like to get full access to all Nation content on your personal computer, tablet, or smart phone? Current subscribers log in to "Add All-Access Nation"
The app, served by Zinio and compatible with the iPad/iPhone/Android devices, allows for easier readability on the devices and the opportunity to reflow each issue as text-only. All-Access Nation subscribers will also receive a weekly email alert announcing the issue's availability, in addition to it posting in your Zinio library. Please note that without the All-Access Nation* upgrade, your regular Nation print or Online subscription does not include e-reader, tablet or smartphone access through the Zinio App. Prefer to read The Nation on your tablet, computer or smart phone? We have several options for you to choose from (and more on the way). The Nation's Online Edition (see above) can also be viewed via the web browser on any tablet (e.g. IPAD) or smart phone. You can subscribe to the Online Edition here. As noted above, the Online Edition is updated each week when we go to press with the print issue and includes access to our full digital archive (1865-present). The Nation's Online Edition is optimized for viewing on each device, and can be viewed as a web page or as an exact replica of the print edition. Print subscribers can access the entire Online Edition FREE simply by registering. If you like to keep on top of the latest from our bloggers, download the FREE Nation Now application. A continually updated, easy-to-read app, it delivers to your IPHONE or IPAD every Nation blogger on breaking news and analysis, politics, culture and sports throughout the day. Featuring: Katrina vanden Heuvel, Eric Alterman, Jeremy Scahill, Katha Pollitt, Chris Hayes, John Nichols, Greg Mitchell, Robert Dreyfuss, Peter Rothberg, Melissa Harris-Perry, Leslie Savan, Dave Zirin and others. You can download Nation Now in the iTunes store and the Android Market. NationNow, our blog content app, launched on the iPhone in November 2010. It launched on the Android platform in May 2011 making it available on hundreds of Android-based phones and tablets. You can download the Android Nation Now application here. Additional applications are in development for other phone and tablet operating systems. See this space for updates on new offerings. Meanwhile, remember that you can subscribe to the Online Edition and view all Nation content via the web browser on ANY DEVICE. 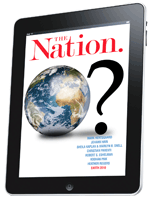 Love your e-reader and want to access the new Nation on it every week? 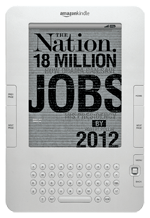 The Nation is available for purchase separately on all the major e-readers. Subscribing is easy and issues download immediately. (Please note that your Nation print or Online Edition subscription does not include e-reader access. E-reader access issues and problems should be addressed directly to the e-reader company; The Nation does not control access to these devices and unfortunately cannot address customer service problems). Please note that your e-reader subscription does not give you full online access to TheNation.com. You may order The Nation in single issues or via subscription directly through your NOOK by tapping "Shop" on the device Home menu or through their website. 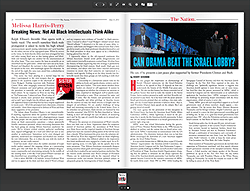 The Nation will be delivered to your online digital library immediately and downloaded to your NOOK within about a minute. New issues for subscriptions are delivered and downloaded automatically. If you own a NOOKColor, you may read The Nation on another tablet via its reading app. Please note: Nation NOOK subscriptions are available on the proprietary Nook reader devices only and NOT through the NOOK application on PCs, tablets, etc, WITH THE EXCEPTION OF the NOOKColors' reading app. If you have a Sony Reader, you may order single issues or subscriptions to The Nation directly from your computer or from a wireless connection (for the wireless Sony Reader). To order, visit the Sony eBookstore. You may also click here to visit The Nation at Sony's site. Once you subscribe, future issues will be automatically delivered to your device. Please note: Nation Sony Reader subscriptions are available on the proprietary Sony Reader devices only and NOT through the Sony Reader application on PCs, tablets, etc. You may buy a single issue or subscription to The Nation directly on your Kindle device by pressing the Menu button and selecting "Shop in Kindle Store". You may also purchase a subscription via the Kindle's web store. To start your subscription, visit The Nation's detail page in the Kindle store and click the "Subscribe now with 1-Click" button. 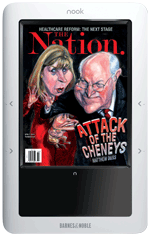 If you own a Kindle Fire, you may read The Nation on another tablet via Kindle's reading apps. Please note: Nation Kindle subscriptions are available on the proprietary Kindle reading devices only and NOT through the Kindle application on PCs, tablets, etc, WITH THE EXCEPTION OF Kindle's reading apps. *Note: This is available only to print subscribers who provide an email address with their subscription. ***If you own a Kindle Fire, you may access your Nation subscription on the iPhone and iPad via Kindle's reading apps. Similarly if you own a NOOKColor, you may access your subscription on the iPhone and iPad via NOOKColor's appropriate apps.